Picking the right place to make “home” will shape your experience in Vietnam. No two cities offer the same vibe and with Vietnam being such a long, narrow country the difference between living in the north VS living in south can be vast. Considering I’m still living in Ho Chi Minh City, more than 2 years after moving, I think its safe to say that for me Saigon was the right choice! I have definitely fallen head-over-heels for my adopted home! Not everyone suits this vibrant city, and there are elements that might suit your personality, but overwhelm others. 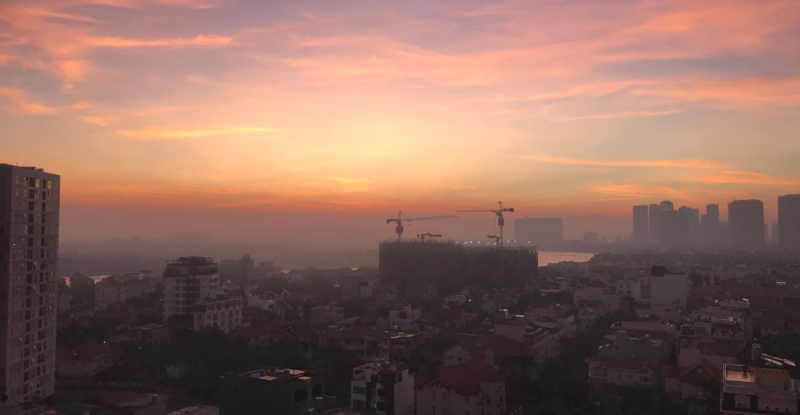 We all have different perspectives of what is important, but here is a rundown of pros and cons from my experience living in Ho Chi Minh City. As the largest city in Vietnam, and one of the fastest growing in Asia, Ho Chi Minh City offers a dynamic expat scene with lots of opportunities to build a bustling social life. There are hundreds of events happening every month and new clubs, sports teams and classes are popping up all the time! From my personal experience travelling all over Vietnam, I have to agree with general consensus that Vietnamese in the south are kinder and more open than in the north. Living among locals who are welcoming of foreigners really helps make the experience of living in Vietnam special. The teaching English market is booming in Vietnam, and Ho Chi Minh City is no exception. A lot of the education companies are constantly expanding, recruiting new teachers and there is no shortage of jobs being advertised for TEFL qualified English teachers here. Between the French colonial buildings and the modern skyscrapers, its easy to adapt to any culture-shock in Ho Chi Minh City. There are wide roads making the city easy to traverse as well as a huge network of grab drivers to take you where you need to be. You’ll find English speaking hospitals, a variety of home delivery apps and even apps for finding handymen and cleaners in English. The city is highly developed (you can literally find wifi EVERYWHERE) and life is easy to navigate here as a foreigner. Ho Chi Minh City is a huge city. One of the pros that comes along with this is that there is a massive selection of accommodation, transport options and general lifestyles you can live. Different districts offer different expat experiences, from authentic Vietnamese to extravagant. This is perfect if you looking to save money. Being close to Vietnams biggest airport makes travelling easy and, often, very affordable within Vietnam and Asia. This is one of the biggest advantages to living in Ho Chi Minh City. Food in the south of Vietnam is so varied, fresh and cheap! Fresh food markets are abundant, as is street food. Where Ho Chi Minh City is set aside from other places is the luxury of being able to find any and EVERY cuisine you could dream and CHEAP. From Italian to Mexican, Japanese, even Syrian, Ho Chi Minh City literally offers it all. From favourite cosmetics to comfort foods, you can find almost all western comforts in Ho Chi Minh City. There is sometimes a hefty price-tag, but living on an English teacher wage makes it possible to afford and enjoy all western comforts. (psst: Scottish friends, you can get irn bru at Annam in District 2). Ho Chi Minh city is a youthful city with a large population of English-speaking Vietnamese. Knowing a small selection of phrases is enough to be able to live without problems. Vietnamese is a complex, tonal language and very challenging to pick up. Ho Chi Minh City experiences two seasons: wet and dry, however the weather remain hot throughout both seasons. The north of Vietnam, where Hanoi is, experiences 4 marked seasons with accompanying changes in temperature. Some people might not enjoy living in a hot, humid climate but I love the feeling of year round summer. The busy energy of city living is one of the main cons of living in Ho Chi Minh City for most expats. Coming from the west it can be very overwhelming to see the number of bikes on the road. It is a scary prospect crossing the street during rush hour and taking on the road on your own can seem terrifying. You can quickly pick up the rules of the road and once you do, you will start to feel much more comfortable on the road. My biggest piece of advice is not to rush the process. You’ll know if you are ready to start driving yourself. Living in any Vietnamese city is going to come with air pollution due to the high density of people and motorbikes. Ho Chi Minh City has cleaner air than Hanoi but there are some days where you can feel it. To avoid inhaling polluted air many people wear pollution masks. I use and recommend the AQ Blue masks which can be ordered in Ho Chi Minh City and Hanoi. With a large tidal river running through the city, and a number of canals branching off it, it might not be surprising to learn that Ho Chi Minh City regularly floods during monsoon season. The flooding damage isn’t major and because it is the same streets that floor every time locals are somewhat prepared. When streets flood it makes it challenging and dangerous to travel around. If you are planning to move to Ho Chi Minh City then you are mostly considering living in districts 1, 2, 3, 4 or 7. These are where most expats live due to their proximity to the city centre and abundance of nice accommodation (lots of high rises with pools and gyms). As a result, businesses in these areas cater heavily to English speaking expats so you’ll find lots of import shops, coffee shops that transport you to Europe, pub quizzes and restaurants selling every cuisine under the sun. This appeals to some expats and doesn’t to others. That’s fine, not everyone wants the same experience living abroad. But I do think it’s important not to get sucked into the bubble completely and to experience more of what makes living in Vietnam so special – local friends, Vietnamese food and bustling streets. The same occurs in Hanoi, but I feel like the situation of district 2 and 7 being slightly out of the centre of Ho Chi Minh City makes it easy to fall into that expat bubble. The south of Vietnam doesn’t have the same dramatic scenery as the north of Vietnam and so there aren’t as many interesting day trips to take from Ho Chi Minh City. Ho Chi Minh City doesn’t really have somewhere in comparison to the lakes in Hanoi. There are parks but the majority can feel a bit hectic, with skyscrapers and busy roads surrounding them. The best park I’ve found is at the Vinhomes Central Park complex near district 2. While picking a city to move to is an important decision, don’t forget that you can (and should) change base if you arrive and things don’t suit your needs! I hope this rundown of my pros and cons has offered some insight into what it is like living in Ho Chi Minh City! Found this post useful? Pin and share it! Such an exceptional read, Frances! I’ve learned so much about Ho Chi Minh City from reading your post and I would love to cross it off my bucket place soon! Ah such a helpful guide! I haven’t totally ruled moving Vietnam out in the future especially if I want to go back to teaching for another year. I was surprised by how much I preferred HCMC/Southern Vietnam to Hanoi/Northern Vietnam in terms of interactions and weather! That would be so cool Samantha! They are really very different places aren’t they. We like to think of HCMC as still a bit of an undiscovered gem by most tourist who only scratch the surface! Great read, thanks. I am trying to decide between Vietnam and Thailand for my next teaching job, and your list of pros and cons has been super helpful! I’m a bit put off by the lack of nature escapes.. what do you do for exercise?? Is there anywhere to walk around, or are you restricted to the gym? Great post!! My husband and I will be moving to HCMC this summer. What are your insights about living in Bin Than, the area near the river opposite the zoo? We wanted to be close to downtown but still have an authentic experience and be somewhat out of the “ex-pat bubble”. It’s in the back of the store in D2, where the cans of soft drinks are stored.